Electrical engineering is a field of engineering that mainly deals with the study of electricity, electromagnetism and electrical machineries. This stream in engineering has gained widespread recognition because of the vast job opportunities and the rising demand of professional electrical engineers. Electrical engineering is a broad field that constitutes of the telecommunication engineering, power electronics, electronics engineering, microelectronics and several other fields. Diploma in electrical engineering is in great demand in recent times because of the vast job opportunities that it provides with. The course of diploma in electrical engineering has a wide variety of subjects and deals in an extensive study of the core electrical topics. The Diploma syllabus for Electrical Engineering Department. The diploma syllabus for electrical engineering includes the basic study of electronics. The introduction to semiconductor devices, rectifiers, oscillators, filters, feedback amplifiers, pulse and switching circuits are the main topics of basic electronics that are taught in diploma course. Electrical Circuits subject deals in the study of the network theorem, basic study of A.C circuits, single phase A.C circuits, three phase A.C circuits etc. Electrical Technology Volume 1 by B L Theraja is recommended for this subject. Electrical Measurements and Measuring Instruments comprises of topics like basic concepts of electrical measuring instruments, current, voltage, power and energy measurements, dielectric measurements, A.C bridges and measurements of several other electrical quantities. Electrical Machines is the core subject for electrical engineering. It deals in the study of various machines that are used for electrical engineering purposes. Electrical Machines 1 constitutes of topics like single phase transformers, three phase transformers, basic concepts of D.C Machines, D.C Generators and D.C Motors. Introduction to A.C Machines, basic features of A.C Motors, study of alternators, FHP Motors and A.C Motors are also a part of this subject. Electricity generation and transmission is a big issue that is faced by the electrical engineers. A thorough study of these topics is important to curb the losses that occur during generation and transmission. The subject Electricity Transmission and Distribution deals precisely in this area with the topics like generation of electrical power, distribution systems and cables, economics of power generation, tariffs, loads etc. Digital Electronics is the study of multiplexer/demultiplexers, encoder/decoder, logic gates, ALU and other digital circuits whereas Instrumentation and Control includes telemetry, process control, measuring systems, transducers and measurement of physical quantities. Another subject is Estimation and Costing which deals in domestic and industrial wiring and service connections, estimation and costing, and repair and maintenance of electrical products. Power Electronics is another core subject that comprises of topics like power rectification, inverters, converters, speed control of motors and regulated power supply. Electrical Installation, Maintenance and Testing includes the environmental pollution prevention, electrical accidents and safety measures, earthing, installation and preventive measures. Electric Traction, Switchgear and Protection, and Power System Operation and Control are some of the other primary subjects that are a part of syllabus of electrical engineering diploma course. Thus the syllabus of the electrical engineering leads to a comprehensive study of the subjects related to electrical engineering. It not only deals in an extensive study but also encourages new and innovative techniques that can be tested and implemented for the benefit of the society. 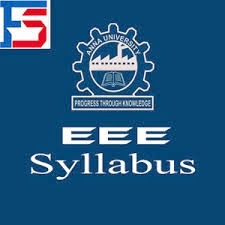 Kindly post your replay for "Electrical Engineering Syllabus for Diploma course."